It is breeding season until the heat of summer when the rats won't take. So if you want babies, now is the time. I have plenty in the nursery now. Please remember I will not have litters posted in July and August. I wanted to post info about the recent Seoul Virus outbreak in the USA. This way I am upfront about it and the public has info about this situation, as some new adopters who stop by my website may not even know about the situation at all. While humans can get it, yes, the risk according to the CDC is VERY low. It's not as bad as the common flu as far as symptoms and contracting it is even more difficult. You have to actually be bitten by a rat who has it, or ingest aerosol from urine, or come in contact feces and get that in a cut or in your body somehow. You cannot even get it from another human. Also as the investigation continues in the USA it's becoming more widespread than anyone knew. It may have always been all over the USA in the first place. For a very long time. But no one thought to test for it. Or look for it previously. The CDC and state health departments are investigating this virus and tracing each rattery and adopter the infected rats went to. They are eliminating the animals and getting rid of the virus as they find it. The investigation the CDC is doing started from 2 infected ratteries in Illinois and Wisconsin from the fall of 2016 till now. I have not gotten rats from these areas. I did get rats from Canada, in October of 2016 and mingled those with mine after a quarantine of 2 months. None of the Canadian breeders I have adopted from have Seoul positive rats as of today. (Update 3.20.2017: The Canadian breeders have tested their rats and every single one of them were negative! They tested entire colonies, not just a select few. So I am not at risk with those rats at all!) : I also got rats from Utah in the beginning of August of 2016, but as was posted on my site when I got them they did not make it out of quarantine. I was not happy with them at all and decided not to use them. So they were not in the same building as mine. So that batch is not a factor for me. Again, I am not connected to any ratteries that had positive rats. I am currently working with my vet and IDEXX to get my rats tested. However according to the Colorado Department of Health who I have been working closely with since the beginning of this outbreak, I am not under investigation and I can go ahead and adopt out rats like normal. I had been on a hiatus from breeding just because I wanted a break, since before the outbreak. I have taken a total of 5 months off of breeding. But this week I am reopening my doors and have posted a litter for adoption with the permission of the Colorado Health Department to adopt out again. I would like to do my best to educate the public on the small Seoul virus investigation in Colorado and in the USA. And the best way I know how is to link you to the CDC's site for actual scientific explanations. I will also post the notes from one of the CDC meetings with the rat community. I was present all all of the CDC conference calls and I was the transcriber for the conversations. I had to give my notes to the CDC so they could approve them. This way the public has CDC approved notes. I am in the middle of typing out the notes to the 2nd CDC call and I will turn that in also. But until then I will give you the one set I have. I also have a transcription on the Colorado Health Dept conference call with the Colorado breeders if you want that. But I will link you to the Co Health Dept meeting notes on their page too. Please use these links and notes to educate yourself and your family, also learn how to keep clean and not catch the virus. I also want to mention that in the 2nd CDC conference call Dr. Pierre said that the best way to get rid of the virus is to pull babies away from their mothers at 3 weeks old. And supplement feed them for a week. And then cull the adults. The babies are immune for months. This is a tough thing to do. Especially for myself as I do not cull I adopt out every rat I breed. I always have. And I am very bonded to the adults. However with the science behind it I cannot argue with it either. So I am currently opting for this method. This way I know the babies leaving here are safe as they are immune at any rate. And the public is safe. Many breeders in the USA are making this same decision. Many are culling babies also and I refuse to. Many ratteries are culling their entire ratteries and giving up totally, I will not do that. I have a strong commitment. Having said that, I am not at risk, but the public's safety is my priority. So my current adults will go this way, and all generations after I will not have to do this. IDEXX has continued to frustrate breeders all over the USA by constantly changing their rules on getting test strips, I have ordered them 2 times. It's taking a very long time to get them. So I have to go with my plan B until those strips come. With my continued transparency and extreme straightforwardness in my breeding program, as I have always done, this tells you where my ethics are. And you can make your own decision. Consider this a public post giving all of my adopters info on the virus and rats possibility of contracting and carrying the virus. Even though my rattery is not at risk of having the virus or spreading it, there are many ways rats can get infected, so later in your rat's life depending on what you come across in our rats life time (ie.. not washing hands after going to a pet shop or place that has rats like a shelter). So you have the ability to contaminate your own rats. So take that into consideration before adopting. And or take proper precautions to ensure proper cleanliness at home. 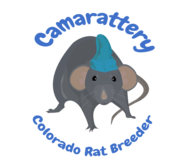 I am happy to announce that Myself and Emerald City Rattery just received and import from out of Country earlier this week. You can see them on both my girls and boys pages at the bottom. They are in the Marten, Satin and Silvermane lines. The Marten and Silvermane are the 1st of their kind ever in Colorado. Emerald City and I will be getting another import from Canada here in about a month or 2 as well for even more varieties. Such as Harley which I've bred in the past years ago and the states first Marbles will be arriving as well. I will also be getting White Sided from Emerald City in NY soon which is a variety once thought lost but it's now back. And last but not least I will be getting one to two shipments of surprises after that. Which I will announce upon arrival. I didn't want to get them all at once and mix them as that's a quarantine nightmare. So I'll stagger it bit to evaluate the health of each shipment individually. Most people come to me because I am one of the oldest breeders in the country. And my lines are some of the most established lines in the US. So that eliminates the need to worry about such issues like bad temperaments, skittish animals or tumors because they were bred out 20 generations ago. People have the satisfaction of knowing every baby they get from me has been bred for health, temperament and longevity and every rat in every pedigree can be verified through the North American Rat Registry. I do not have pet shop stock that is hit and miss with those qualities. These are the best you can get. That is the honest truth. Since I have had the same site since 2005 through webs.com and they are very glitchy and down time is 90% and have poor customer service, I have decided to go with a new website company.